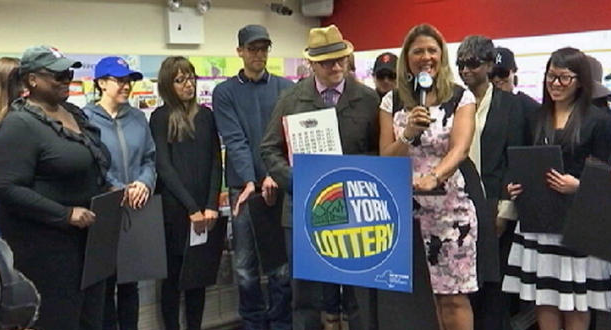 A group of 16 Manhattan co-workers at a New York City biopharmaceuticals company have won a $58 million Mega Millions jackpot. New York State Lottery officials said Thursday the colleagues call themselves the Lucky 16 Trust and come from New York, New Jersey, and California who pooled their money before the March 24 drawing. The Lucky 16 have been playing together since 2010, with each member contributing $4 in multi-state game tickets every week, On March 24, their persistence finally paid off. The winners said the numbers were met with disbelief, as each person double- and triple-checked their tickets, the New York Post reports. Ophthotech Corp. spokeswoman Evelyn Harrison says members of the winning group work in all parts of the company, from senior to administrative posts. The group, comprised of residents of Accord (Ulster County); the Bronx; Brooklyn; Queens; and Manhattan as well as eight New Jersey residents and another who shuttles between New York and her home in California will split a lump-sum payment of $38,334,435 (net $25,369,729). Each will receive $1.65 million after taxes, New York State Lottery officials said Thursday. The group purchased the ticket at Carlton Cards, located near their Penn Plaza offices. A lottery spokesman said that Jay Patel, 69, owner at’Carlton Cards’ will receive a $10,000 bonus for selling the winning ticket. The groups’ plans for the money range from paying off mortgages and loans to investing for retirement. •William Barber of Hackensack, N.J.
•Kevin Berth of Hainesport, N.J.
•Desiree Beutelspacher of Venice, Calif.
•Valerie Chiong of Union City, N.J.
•Janice Graboso of New Brunswick, N.J.
•Matthew Jung of Edgewater, N.J.
•Lillian Vazquez of Jersey City, N.J.
Mega Millions winning numbers for Tuesday, March 24, 2015 are 2, 23, 32, 45, 55. The Mega Ball number is 12. The Megaplier number is 02. Sixteen co-workers at a New York City biopharmaceuticals company have won the jackpot.